Martin O'Neill has been confirmed as Sunderland manager. The 59-year-old former Leicester, Celtic and Aston Villa boss takes over from Steve Bruce on a three-year contract starting on Monday. "It's a very nice feeling to be back in football and to be the manager of Sunderland. It's a big moment for me," said O'Neill. Sunderland chairman Ellis Short said: "Martin has as good a managerial pedigree as you could wish to find." 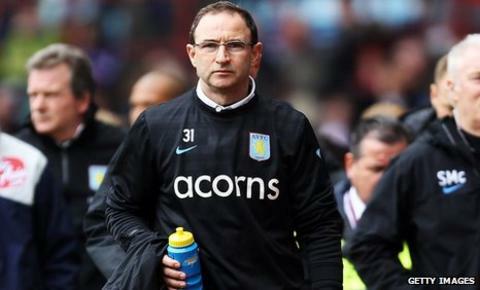 As reported by BBC Sport, O'Neill was Sunderland's first choice to replace Bruce, who was sacked on Wednesday. O'Neill visited the club's training ground ahead of Sunday's game against Wolves, which will be overseen by Eric Black, Bruce's former assistant. "I'd heard about what a good club it was but coming here, seeing the stadium and training ground, I've been bowled over. It's absolutely fantastic," O'Neill added. "I hope I can help Sunderland to a very successful period. That's what I've come for and that's my driving ambition." Short claims O'Neill has proven himself a "very astute, top-level manager". He said: "During his time at Aston Villa he established the club firmly in the top 10 of the Barclays Premier League year on year and this is something we are striving to achieve at Sunderland. "Having spoken with him over the last two days, I know he is brimming with enthusiasm and anticipation about the challenge of taking Sunderland forward and I believe he is the perfect choice to deliver the success we all desire." The Black Cats have won only twice in the Premier League this season and sit 16th in the table. O'Neill, a boyhood Sunderland fan, has been regularly tipped for vacant jobs at high-profile clubs since leaving Aston Villa in August 2010 and was the bookmakers' favourite for the post. He joined Villa in 2006 and led them to three straight sixth-placed finishes in the Premier League and the Carling Cup final before resigning prior to the start of the 2010-11 season. O'Neill is understood to have met Sunderland's owner and chairman Ellis Short on Thursday evening in London to negotiate a deal, a key part of which is O'Neill's agreement to the budgetary constraints at the Stadium of Light. Celtic manager Neil Lennon, who worked under his fellow Northern Irishman at Leicester and at the Parkhead club, believes O'Neill will be a success. Speaking before O'Neill's appointment was confirmed, he said: "He has a penchant for lifting clubs. "Sunderland is a huge club and I know that, as a boy growing up, it was his favourite team, so there might be an emotional tie there for him." BBC Sport pundit Steve Claridge, who played under O'Neill at Leicester, told BBC Radio 5 live this week: "His track record is very good. "He'll be able to work within certain restrictions with regards finances. He'll need to get a goalscorer but he knows that. "He's a student of the game. He does his homework. He doesn't always buy the obvious. There are always one or two people you won't have heard of. "It's the job which I think deep down he really did want."